BLUE RIDGE, Ga. – Dangerous arctic air has moved into Fannin County following the cold front that brought with it Winter Storm Inga. As the day progressed roads have cleared of the icy conditions that caused treacherous travel situations throughout north Georgia. “The high today was only 17 degrees, so the secondary roads got very little thaw. A lot of them have shaded areas,” Ratcliff explained. The concern going into tonight and the early morning hours tomorrow is black ice. “All that has melted and not dried will refreeze. The temperatures will be in the low teens,” Ratcliff stated. Employees of the Public Works Department will be working late into the evening to help clear roads for emergency vehicles as the need arises. The State of Emergency declared by Georgia Governor Nathan Deal remains in effect for Thursday, Jan. 18. The State of Emergency was declared for 83 counties, including Fannin County. It states that state government offices will remain closed. This comes on a recommendation from the state Emergency Operations Command. There are currently no shelters open at this time in Fannin County. If you are in need of assistance and it is not a life-threatening emergency, you can call the Fannin County Sheriff’s Office non-emergency line at 706-632-6022 or 706-632-2043. All life-threatening emergency calls should be placed to 911. City of Blue Ridge Government Offices will open at 10 a.m.
Fannin County Government Offices will open at 10 a.m.
* WHAT…Occasional light snow and very cold wind chills expected. Little or no additional accumulations are expected. Expect wind chills to range from 10 above zero to 10 below zero. * WHEN…For the Winter Weather Advisory, until 9 AM this morning. For the Wind Chill Advisory, until 10 AM Thursday. * ADDITIONAL DETAILS…Roads will remain icy and treacherous as temperatures remain below freezing all day. If you must drive, use extreme caution. The cold wind chills may cause frostbite in as little as 30 minutes to exposed skin. PRECAUTIONARY/PREPAREDNESS ACTIONS… A Winter Weather Advisory for snow means periods of snow will cause primarily travel difficulties. Be prepared for snow covered roads and limited visibilities, and use caution while driving. A Wind Chill Advisory means that cold air and the wind will combine to create low wind chills. Frost bite and hypothermia can occur if precautions are not taken. Make sure you wear a hat and gloves. 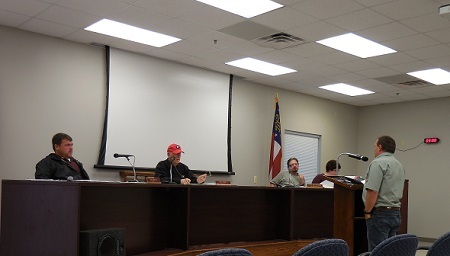 BLUE RIDGE, Ga. – The Fannin County Board of Commissioners (BOC) voted to update the county’s retirement plan at the March 27 meeting. The current county retirement plan is one in which the county funds 100 percent. The plan is managed by ACCG Insurance and is based on stock market projections. According to county Chairman Stan Helton, if the stock market does not perform well, the county must use more money to fulfill obligations required by the plan. BOC discusses and fine tunes new retirement plan. The new plan is a 401A Defined Contribution Plan and works much like a 401K. County employees would be required to enroll in the plan and make contributions. The county itself would then match employee contributions up to a maximum percentage. The newly discussed retirement plan will only apply to new hires of the county. Those employees who have already enrolled in the county’s current retirement plan and employees who have already retired will not see any change to their benefits. Johnson looked over several angles before deciding to support the new plan. A main focus for him was whether or not a fully funded plan was a valuable recruiting tool to get top employees for the county. Johnson motioned to accept the retirement plan for new hires of the county, and Post 2 Commissioner Larry Joe Sosebee made a second. The BOC approved unanimously to move forward with the new plan. The new county retirement plan will be effective July 1, 2018. New employees will be eligible to enroll six months after their hire date. There is no limit as to what an employee can put into the fund, and the county will match up to 4 percent of employees’ contributions. Employees may withdraw their portion of funds contributed at any time. The county has the option to change percentage matched on an annual basis. Public Works Director Zack Ratcliff was present at the meeting and presented the BOC with a current list of roads scheduled to have maintenance and be resurfaced in 2018. Ratcliff reported that 12 roads were completed and three roads were omitted from the 2017 list. 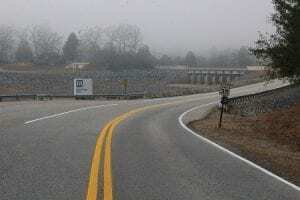 Helton clarified that in 2018 “there are 10 new roads” that are scheduled to see work. By dividing the work into quadrants, the county will save time and money in completing projects. This year, the county also took into account which roads were on school routes. “One road we had was a real safety issue for the school as well as us,” Helton said, describing this new consideration. Snake Nation, Ridge Road, North Old Aska, Harrison & Ada, Old Loving Road, Mabry Lane, Wise Road, Wright Mill Road, Elrod, Blue Bird, Aster Lane, Old Chapel Road, Queen Avenue off of Galloway, Old Dial Road, Mobile Circle, Lowery Road/Brown Mill Road, Mount Herman Road, Hilltop Circle, Doublehead Gap Road, Cypress Lane, Old Skennah Gap Road, Devils Den. 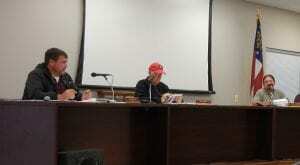 Ratcliff also asked the board to replace a Kubota tractor mower that has been deemed unusable. The new tractor, a Massey Ferguson, would come from Mason Tractor and is on a state contract, which gives the county a 6 percent discount. The price tag for the new equipment is $22,710, which the board unanimously agreed to fund. While present, Ratcliff sought permission from the BOC to approve surplus equipment to be sold online, which the board agreed to do. To date, county equipment sold online has brought in a revenue of $84,872. 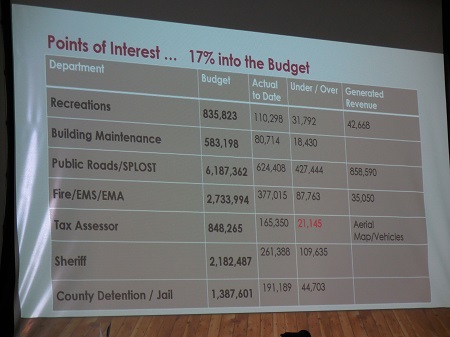 Points of Interest for the 2018 Budget. Fannin County Finance Director Robin Gazaway presented the board with the latest county budget reports through the month of February. 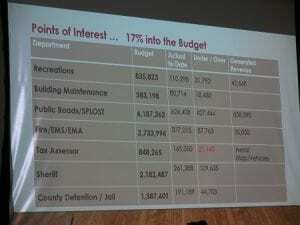 This report shows that the county is currently $1,397,958 under budget. Johnson, also satisfied with the report, said that it is a positive sign that the departments are being frugal with their budgets. Discussions of funding the remaining balance of the new fire station and E-911 facility were also brought up, with Gazaway presenting the option of the county borrowing money from itself and eliminating having to pay interest and fees through a standard loan. The commissioners agreed that borrowing money from the county’s general fund was the best option, but tabled the final approval for two weeks so that research can be done on how and when the county will be able to make repayment. « Previous Article Congratulations to the Fannin County High School (FCHS) Audio Video (AV) Pathway! 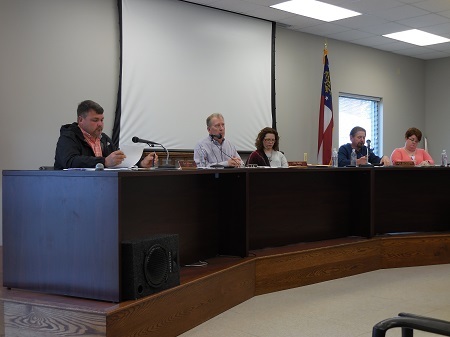 BLUE RIDGE, GA – Fannin County Commission Chairman Stan Helton and Public Works Director Zach Ratcliff discussed the possibility of updating the county’s legislation. Current county codes only allow for used county equipment to be sold through local resources. The equipment must be posted in a local newspaper for two weeks and then a bidding process is open to the public. Helton and Ratcliff felt that an amendment of this legislation to include the wording “and/or….” with the option of putting the equipment on online auction websites would help the county to expedite sales and open up the process to more bidders. Helton and Ratcliff propose amendment to bidding process. County Attorney Lynn Doss stated that much has changed since this legislation was written, and that people look to the internet for their needs. She felt this change did not take away anything from the legislation, but added more options for our county. Johnson and County Post Commissioner Larry Joe Sosebee were very thorough in their questions, wanting to make sure that this amendment would achieve what Helton and Ratcliff were proposing as well as be a long term solution. Johnson proposed the term “competitive bid process,” as this would also give the county the option of live, real time auctions and not restrict the process to online. Doss considered all the concerns and information that was given before drafting an amendment to the legislation. She also suggested that while they were adding this amendment that it might be a good time to look at another wording change that would allow for more flexibility in the passing of the county’s annual budget. Commissioners debate admending county legislation. The current legislation states that the commissioners must adopt the county budget at the first public meeting in December. Doss recommended changing the wording to “adopting the budget by the first public meeting in December.” She said this would give the Commissioner’s the option of approving the budget in advance of the schedule. Doss drafted both the amendment to the sale of county equipment as well as the change in wording to the budget legislation. After much discussion, all three commissioners voted to pass these changes as they felt it would streamline county business as well as open up options previously unavailable. These changes will be discussed and voted upon again at the next two public meetings. 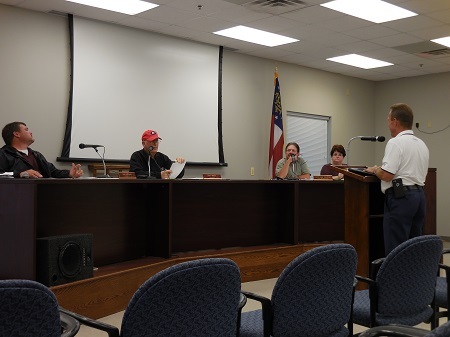 BLUE RIDGE, GA – Fannin County is set to receive new equipment after the Board of Commissioner meeting that was held on Tuesday, September, 12, 2017. Commissioners voted unanimously to purchase a new fire truck and spreader for the county. Public Works Director Zach Ratcliff addressed the Board about the purchase of a new spreader that would salt the roads during inclement weather. Ratcliff found a used spreader for $7,000 that he describes as in “like new” condition. Public Works Director Zach Ratcliff addresses the Commissioners. Fire Chief Larry Thomas asks county for a new vehicle. The original asking price of the vehicle was $59,000, but Thomas had managed to negotiate this price. The sellers came down on price to $45,000 with an agreement to deliver the vehicle to Fannin County. Thomas confirmed that he had received $30,000 in insurance reimbursement after an accident involving one of the county’s fire engines in December 2016. This money would be put toward the purchase of the new vehicle. The new fire engine will be placed at Station 9 to take the place of the vehicle damaged in the December 2016 accident.